Find out how companies are changing their business models and organizational structures in The Digital Transformation of Industries, a live Davos debate taking place at 10.30am on Wednesday 20 January 2016. The Fourth Industrial Revolution is being driven by a staggering range of new technologies that are blurring the boundaries between people, the internet and the physical world. It's a convergence of the digital, physical and biological spheres. It's a transformation in the way we live, work and relate to one another in the coming years, affecting entire industries and economies, and even challenging our notion of what it means to be human. Between 1985 and 1989, the Cray-2 was the world’s fastest computer. It was roughly the size of a washing machine. Today, a smart watch has twice its capabilities. As mobile devices become increasingly sophisticated, experts say it won’t be long before we are all carrying “supercomputers” in our pockets. Meanwhile, the cost of data storage continues to fall, making it possible keep expanding our digital footprints. Today, 43% of the world’s population are connected to the internet, mostly in developed countries. The United Nations has set the goal of connecting all the world’s inhabitants to affordable internet by 2020. This will increase access to information, education and global marketplaces, which will empower many people to improve their living conditions and escape poverty. If we can achieving the goal of universal internet access and overcome other barriers such as digital illiteracy, everybody could have access to knowledge, and all the possibilities this brings. Each time you run a Google search, scan your passport, make an online purchase or tweet, you are leaving a data trail behind that can be analysed and monetized. Thanks to supercomputers and algorithms, we can make sense of massive amounts of data in real time. Computers are already making decisions based on this information, and in less than 10 years computer processors are expected to reach the processing power of the human brain. This means there’s a good chance your job could be done by computers in the coming decades. Two Oxford researchers, Carl Bendikt Frey and Michael A Osborne, estimated that 47% of American jobs are at high risk of automation. A survey done by the Global Agenda Council on the Future of Software & Society shows people expect artificial intelligence machines to be part of a company’s board of directors by 2026. Analysing medical data collated from different populations and demographics enables researchers to understand patterns and connections in diseases and identify which conditions improve the effectiveness of certain treatments and which don’t. Big data will help to reduce costs and inefficiencies in healthcare systems, improve access and quality of care, and make medicine more personalized and precise. In the future, we will all have very detailed digital medical profiles ... including information that we’d rather keep private. Digitization is empowering people to look after their own health. Think of apps that track how much you eat, sleep and exercise, and being able to ask a doctor a question by simply tapping it into your smartphone. In addition, advances in technologies such as CRISPR/Cas9, which unlike other gene-editing tools, is cheap, quick and easy to use, could also have a transformative effect on health, with the potential to treat genetic defects and eradicate diseases. 3D printers will create not only cars, houses and other objects, but also human tissue, bones and custom prosthetics. Patients would not have to die waiting for organ donations if hospitals could bioprint them. In fact, we may have already reached this stage: in 2014, doctors in China gave a boy a 3D-printed spine implant, according to the journal Popular Science. The 3D printing market for healthcare is predicted to reach some $4.04 billion by 2018. 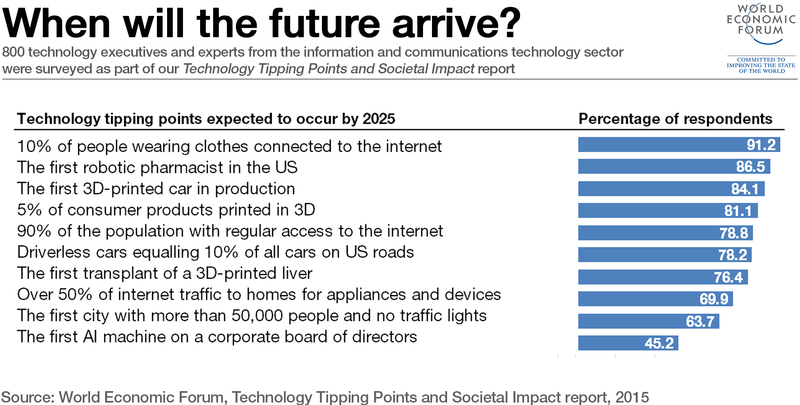 According to a survey by the Global Agenda Council on the Future of Software and Society, most people expect that the first 3D printed liver will happen by 2025. The survey also reveals that most people expect the first 3D printed car will be in production by 2022. Three-dimensional printing, which brings together computational design, manufacturing, materials engineering and synthetic biology, reduces the gap between makers and users and removes the limitations of mass production. Consumers can already design personalized products online, and will soon be able to simply press “print” instead of waiting for a delivery. If almost everything is connected, it will transform how we do business and help us manage resources more efficiently and sustainably. Connected sensors will be able to share information from their environment and organize themselves to make our lives easier and safer. For example, self-driving vehicles could “communicate” with one another, preventing accidents. By 2020 around 22% of the world’s cars will be connected to the internet (290 million vehicles), and by 2024, more than half of home internet traffic will be used by appliances and devices. Home automation is also happening fast. We can control our lights, heating, air conditioning and security systems remotely, but how much longer will it be before sensors are able to detect crumbs under the table and tell our automated vacuum cleaners to tidy up? 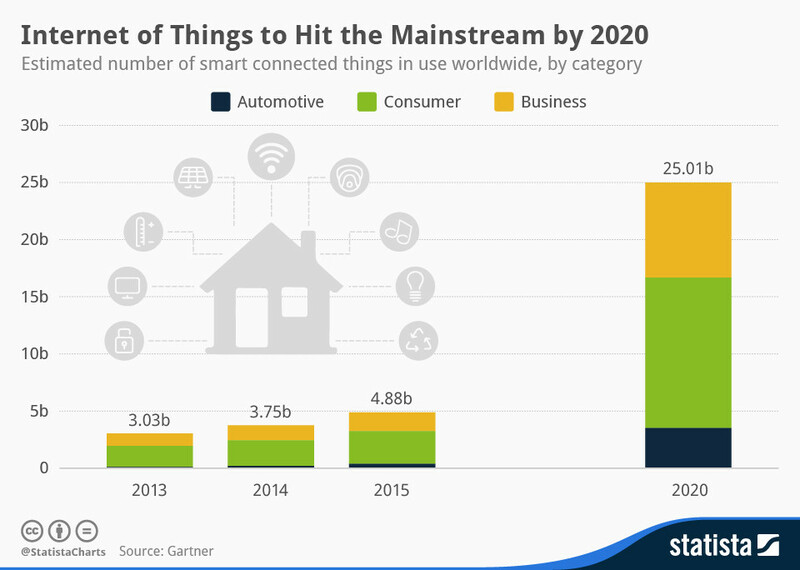 The internet of things will create huge amounts of data, raising concerns over who will own it and how it will be stored. And what about the possibility that your home or car could be hacked? Only a tiny fraction of the world’s GDP (around 0.025%) is currently held on blockchain, the shared database technology where transactions in digital currencies such as the Bitcoin are made. But this could be about to change, as banks, insurers and companies race to work out how they can use the technology to cut costs. A blockchain is essentially a network of computers that must all approve a transaction before it can be verified and recorded. Using cryptography to keep transactions secure, the technology provides a decentralized digital ledger that anyone on the network can see. 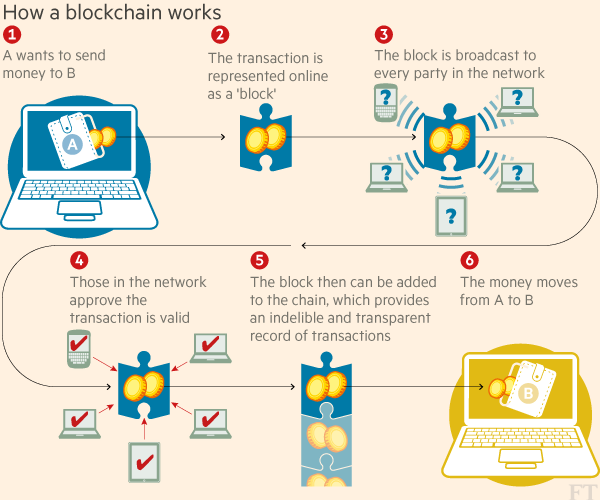 Before blockchain, we relied on trusted institution such as a bank to act as a middleman. Now the blockchain can act as that trusted authority on every type of transaction involving value including money, goods and property. The uses of blockchain technology are endless. Some expect that in less than 10 years it will be used to collect taxes. It will make it easier for immigrants to send money back to countries where access to financial institutions is limited. And financial fraud will be significantly reduced, as every transaction will be recorded and distributed on a public ledger, which will be accessible by anyone who has an internet connection. Technology is getting increasingly personal. Computers are moving from our desks, to our laps, to our pockets and soon they will be integrated into our clothing. Implantable and wearable devices such as sports shirts that provide real-time workout data by measuring sweat output, heart rate and breathing intensity are changing our understanding of what it means to be online and blurring the lines between the physical and digital worlds. The potential benefits are great, but so are the challenges. These devices can provide immediate information about our health and about what we see, or help locate missing children. Being able to control devices with our brains would enable disabled people to engage fully with the world. There would be exciting possibilities for learning and new experiences. But how would it affect our personal privacy, data security and our personal relationships? In the future, will it ever be possible to be offline anymore?